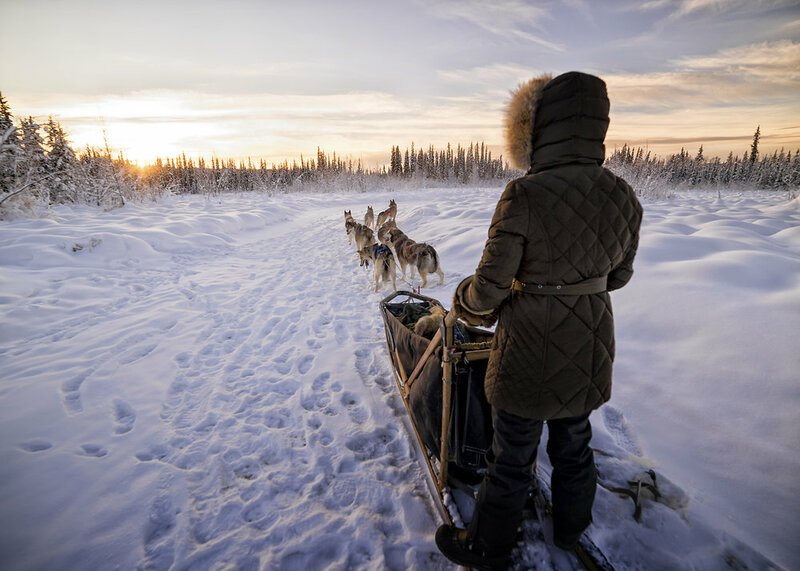 Meet our friendly and fuzzy team of Alaskan Huskies and take a ride along exciting trails that wind through a beautiful valley and along a frozen creek. Get dressed for the outdoors in our cozy off-the-grid cabin. We provide warm parkas with ruffs, overboots, snowpants, overmitts, handwarmers, some hats and neck gaiters. We ask that you bring your warmest gear with you and we’ll take care of the rest. Our trip will take us roughly 6-miles, circumnavigating a largely uninhabited section of the valley, surrounded by rolling hills. We’ll travel on a series of interconnected winter trails through forest, bog, lake, and along the creek. Using voice commands, we will navigate our way through the trail system, both enhancing your experience as well as training our dogs. We stop on the trail for plenty of dog petting and pictures. Tours are by reservation only, our home is also our business. We are located close to the University of Alaska Fairbanks, 15 minutes from downtown Fairbanks. Pick-up is available upon request for an additional $25/direction ($50 total for round trip for up to 5 people) from most Fairbanks locations. 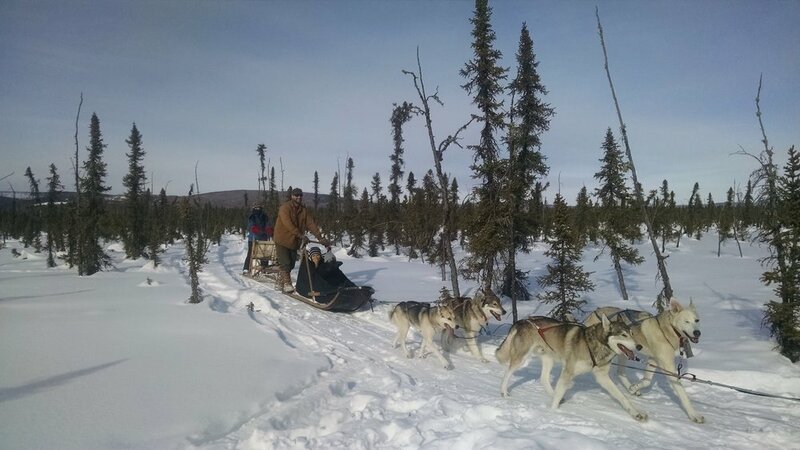 We do not have specific weight or fitness requirements for our dog sled tours, but dog sledding is an active sport. Guests need to be able to jump on and off and walk behind the sled if need be. Participants need to be fairly fluent in English for safety reasons and we do not accept children under the age of 10. If you are wondering if this is the right tour for you, please ask us! 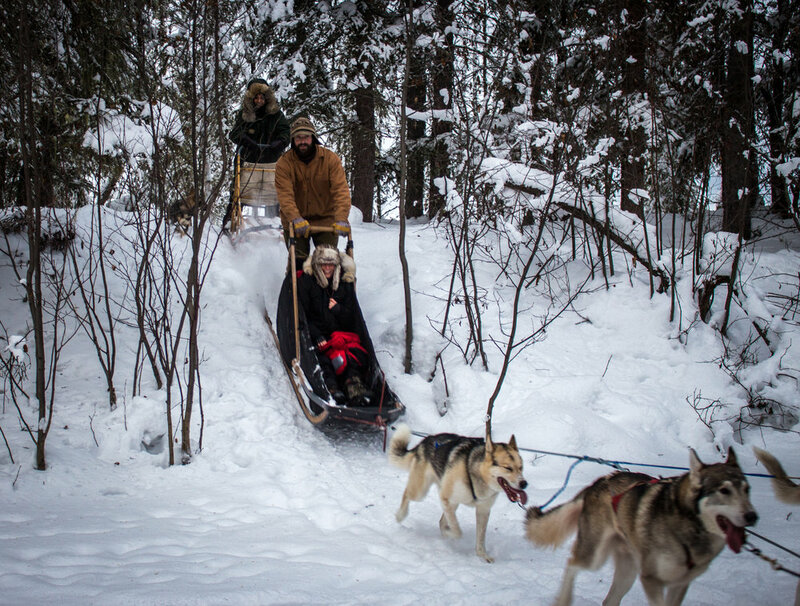 DURATION: 2 hours (45 minutes-1 hour in the sled, 1 hour meeting the dogs, taking photos, getting geared up). WHEN: By appointment, November 15-April 1. Please email or call as far in advance as possible to schedule! COST: $150/person. Military and Alaska Airlines employee discount 10% upon request. BOOK NOW! To book you need to check in with us to see if dates are available. You can do this by (1) Filling out the form below, (2) Call Jenna or David at 248 568 0345 or (3) Send us an email us at borealjourneysak@gmail.com. Number of people in your party-please include ages if your party has children under 16. Would you like to drive yourselves or get picked up ($50 round trip)? Thanks for contacting us! Your request has been sent to our e-mail and we will get back to you shortly. If you don’t receive a response within 24 hours, please check your junk mail/spam folder and call (248) 568-0345. Looking for more to do in Fairbanks? Snowshoeing is a perfect way to get some exercise and experience beautiful Goldstream Valley. Add a snowshoe tour to your trip for discounted price of $50/person when purchased with a dogsled ride. Learn more about snowshoe trips by clicking here! Really nice people and we really had so much fun with the dogs!!! Jenna and David were referred by our local cabin host. They were described as passionate, young and authentic mushers. It turned out that our cabin host was absolutely right.